Posted on February 2, 2016 by Aarti Bhavana. In the weeks leading up to the ICANN 55 Meeting at Marrakech , we are doing a series of posts tracking the CCWG-Accountability process. Through these posts we will be examining all the recommendations and trace their developments since the third draft proposal was opened to public comments late in December, 2015. A quick summary of the third proposal can be found here. January has been an extremely busy month for CCWG-Accountability members and participants, who have participated in over 24 hours of calls and countless discussions on the mailing list, to finalise the draft proposal to meet the NTIA’s extended deadline of 30th September 2016. This post examines Recommendation #1: Establishing an Empowered Community for Enforcing Community Power, which details the functioning of the Sole Designator as the Empowered Community, and Recommendation #2: Empowering the Community Through Consensus: Engage, Escalate, Enforce, which explains the process of decision-making within the Empowered Community. It also highlights the keys concerns raised in the public comments and by the ICANN Board, to study the changes made to these recommendations over the past month. Introduced in the third draft proposal, this Recommendation sets up the Empowered Community in the form of a Sole Designator (a shift from the sole member model). This entity consists of representatives of the participating Supporting Organizations (SOs) and Advisory Committees (ACs), who are known as Decisional Participants. The Sole Designator has the statutory right to appoint and remove an individual director or the entire Board of directors. In addition, the right to inspect was also included, to enable this entity to inspect ICANN financial records. Through the public comments and subsequent conversations, the two most extensively discussed aspects within this recommendation have been inspection rights and the role of GAC within the Empowered Community. In the third draft proposal, the CCWG-Accountability proposed to give to the Empowered Community an additional, non-statutory right in the form of the right to inspect. This right, normally available only to members under Section 6333 of the California Corporations Code, would allow the Empowered Community to inspect accounting books and records, as well as minutes of meetings of the Board and committees. The inclusion of this right was part of the compromise to shift from the membership model proposed in the first two drafts, to the designator model. In their comments to this proposal, the Board agreed with the inclusion of the right, but recommended limiting its exercise to an escalation process, as required for other community powers. According to this proposal, exercise of this right would require following the escalation path of ‘Petition-Community Forum-Decision’, with support from at least three decisional participants at the decision stage. Most of the community disagreed with this, as it was felt that this right needed to be simple since it is absolutely essential for accountability and transparency. Requiring a lengthy process of support from multiple decisional participants was thought to be unnecessary for the exercise of this right. Through further discussions over the calls, the Board explained that it could support an inspection request from a single SO/AC in matters relating to financial records and books of accounts, but would need a higher threshold for more complex matters. It was finally settled that the single threshold would apply for accounting records, while a higher threshold of three decisional participants would be required for investigations. Accordingly, a distinction has been drawn between the right to inspect and investigation right. Therefore, the right to inspect will not be given to the Sole Designator, but be made available to Decisional Participants alone. This clarifies the process of exercise of the power, as it can be invoked by any one of the five participating SO/ACs, without having to resort to the escalation process. The new investigation right, suggested by the Board in its comments, is reserved for more complex matters like fraud or mismanagement, and would give the community transparency in such investigations. This is a community power, and as mentioned above, requires support from three decisional participants. It shall be added as a fundamental bylaw. However, it must be noted that these powers are different from the Document Information Disclosure Policy (DIDP), under which any individual can file a request. Another significant issue raised in the public comments was over the role of the Advisory Committees as decisional participants, GAC in particular. While GAC itself has not confirmed one way or the other whether it will participate in the Empowered Community, the CCWG members and participants have been discussing whether it should even be allowed the choice. The NCSG has been very vocal about its position- allowing GAC to be a decisional participant would mean that it would have a decision-making role, something it does not have at present, and one never envisaged for this Committee. Concerns were expressed that this would change the structure of ICANN, making it a government-led body, which is in violation of NTIA criteria. This position has been supported by the GNSO comments as well. Other members also raised similar concerns and felt that GAC should be an advisory member to the Empowered Committee. However, several others, including members of the GAC, felt that the CCWG-Accountability is creating a new structure, and GAC should be allowed to participate in it, if it so chooses. Concerns were also raised over the effect of removing GAC from the decisional participants, as current thresholds for the exercise of community powers were calculated on the assumption that there would be five decisional participants. Without GAC, this would be reduced to four, which some felt could threaten the entire model. During the last call, it was decided that GAC will be allowed to be a decisional participant, despite the opposition by some. Dissenting members will be given the option of expressing their views in a minority statement, as has been done in the past, as this recommendation has now been finalised. Ushered in through the third draft proposal, this recommendation introduced the Triple-E Approach, which was developed in Dublin to institute a requirement for the ICANN Board to engage with the community on any key decision that could potentially invoke the use of the community powers, through the three-step process of engagement, escalation and enforcement. Engagement refers to a public consultative process to gather community input before the Board takes any action on certain issues. Escalation consists of a series of steps, as visualized below. These mainly include a petition, conference call, community forum and decision. There must be certain thresholds of community support to move from one step to the next. Enforcement shall be considered only if the ICANN Board does not comply with the empowered community’s decision to use a particular power. Unlike the previous recommendation, this one has not been subject to much criticism or debate. However, one aspect of concern to the community was the tight timelines in the Escalation process, which many thought was unrealistic. As mentioned above, the third draft proposal described an escalation process consisting of a petition, conference call and community forum, following which the Empowered Community would decide whether to exercise the community power in question. Multiple steps packed into the Escalation stage meant very tight timelines to organise the community towards making these crucial decisions. Not wanting to stretch out the process by extending the timelines for each stage, a compromise was reached and the escalation steps were modified. 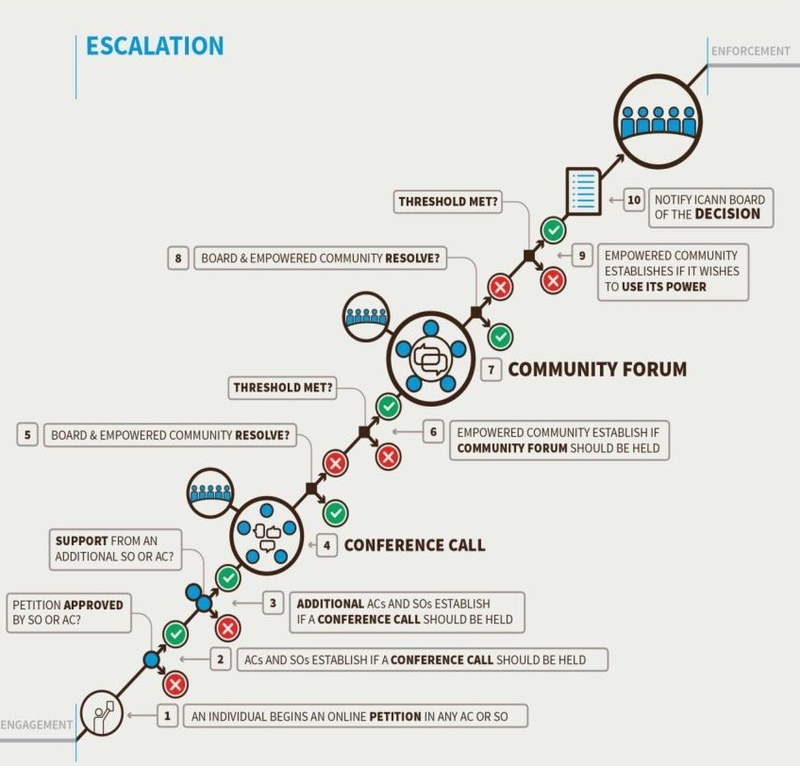 Now, the Conference Call and Community Forum stages have been merged (i.e., Steps 3, 4 and 6 in the figure above), so a longer timeline is available for organizing the forum. The petitioning SO/AC still has the option of requesting a Conference Call to discuss the issue before the Forum. However, since the Community Forum will be a virtual meeting, much like the Conference Call, it was felt that the two steps would duplicate the process and could be merged to save time. The merging of the steps also resulted in the amendment of the table outlining the threshold levels for the escalation process, to remove the Conference Call column. Resultantly, the threshold levels for deciding whether to organise a Community Forum have been lowered to the level previously required for holding the conference call, with two exceptions. One, in the case of the power to recall the entire Board, there is still a requirement of support from four decisional participants, with no more than one objecting. The Board was very clear that it would not support the lowering of thresholds for this power, as it thought that exercise of this power must require full community support. Second, the power to approve changes to the fundamental bylaws only requires support from 3 decisional participants at the decisional stage, to provide a stronger protection to the fundamental bylaws. Therefore, if the Board approves a certain change in the fundamental bylaws, it would not pass unless at least three decisional participants also support this change. Public comments also reflected the need to explain how the threshold levels will change in the event of a change in the number of decisional participants, for example, if one of the current decisional participants choose to not participate any more, or if the RSSAC, SSAC or any new SO/AC created wants to join as a decisional participant. The Board recommended that threshold levels be converted to percentages, to be applied when the number of decision participants changes in the future. However, members have expressed concerns that converting number thresholds to percentages could result in creating a higher or lower threshold than intended, depending on the number of participating SOs/ACs. The Board’s suggestion has been included as an option open to the Empowered Community if and when a new SO/AC is created (or removed). Public comments also sought explanations for terms such as ‘engagement’ and ‘resolution’, which have now been provided. This modified recommendation has been suitably modified by the CCWG-Accountability legal counsel, and now awaits final comments from members and participants of this working group. We will keep you updated about the developments over the coming days, as this recommendation is finalised. Tagged Accountability, CCWG, IANA transition, ICANN, ICANN55, Marrakech, membership, NTIA Transition, and sole designator model.